The French locals love this South African bread, it is probably because of the similarity to Brioche which is to what Mosbolletjies owes a small part of its deliciousness. We bake ours in individual copper cups, which I originally bought as cocktail cups for making a Russian mule. So between the French, South-Africans the Russians and the mules, we love to watch our guests break the warm mosbolletjies gently on its seam and generously dipping it into a lemony olive oil from the neighbouring village of Menton. 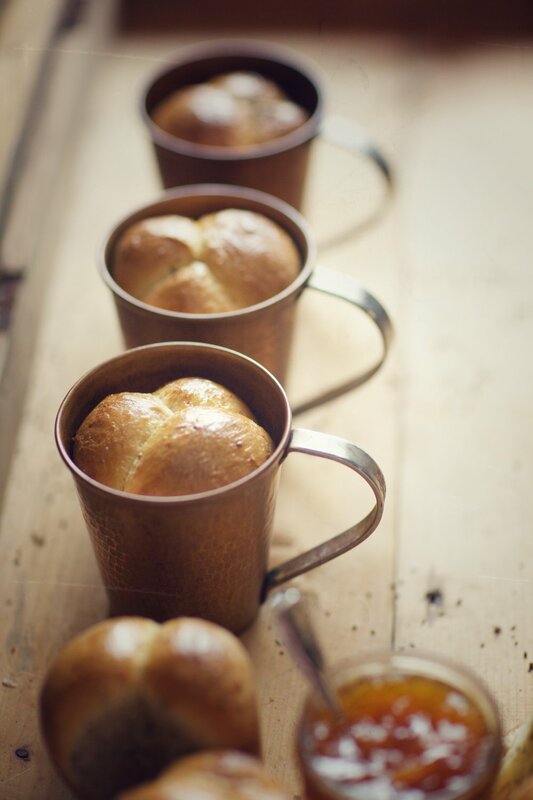 Preheat the oven to 180°C, use 26cm x 7cm loaf tins or individual tin cups. (Blik bekers) Spray generously with baking spray or line with melted butter. Mix the flour, sugar, yeast and aniseed on low speed in a standing mixing bowl fixed with the dough hook. Warm the grape juice and add the butter to melt. Then add to the flour mixture with the warm milk and water. Mix on a medium speed for 10 minutes until the dough comes together. Add the salt and mix for another 10 minutes. Remove the dough and place into a sprayed bowl and cover lightly with plastic film. Allow to stand for 20-30 minutes in a warm place until the dough has almost doubles in size. Knock down the dough and start shaping balls by using your thumb by pressing the dough through a circle formed by your other thumb and forefinger. We spray our hands lightly with the baking spray to help the dough not to stick. 3 balls per cup tightly squeezed in. Place the cups in a warm area to proof for 20-30 minutes, this might take longer depending on the temperature. Make sure the mosbolletjies are well proven, as this will with out a doubt affect the soft texture. Bake at 180°C for 30minutes or until light brown. Remove immediately from the tin cups as they will sweat. Melt the apricot jam and brush onto the heads of the mosbolletjies. To serve place back into the cups.